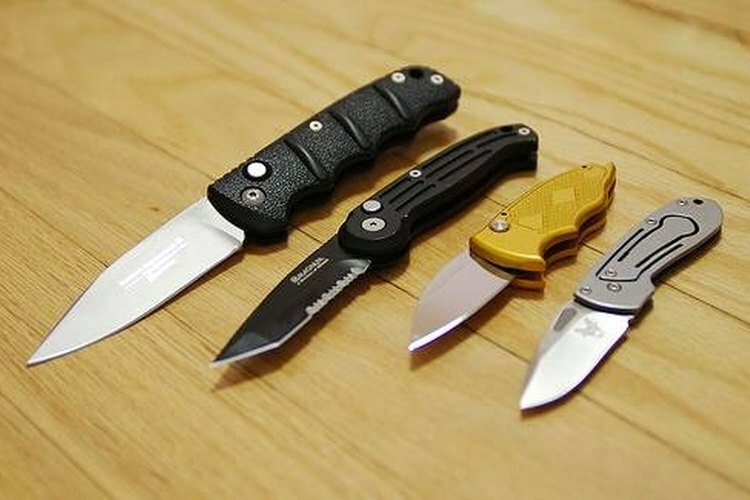 Switchblades have been made illegal in some states because of their association with criminals. Though switchblades can protect the owner from the blade when the blade is not in use, the lever can sometimes be accidentally triggered. But switchblades can still be used correctly. There are two types of switchblades. One type of switchblade is the side-folding switchblade and the other type is the OTF switchblade (out the front). What defines a switchblade is the switchblade's ability to be opened by a button and manually closed. Blades that open from the side open on a hinge. These types of blades contain some type of spring. But the mechanical energy of the spring is contained by a latch. Pressing the button releases the latch, which causes the blade to quickly open. Some blades that appear similar to this model are the Swiss army knives, though these knives sometimes have to be opened manually. OTF switchblades are single-action or dual-action. Dual-action switchblades use spring tension that is increased or reduced using a sliding button. Single-action switchblades have to be retracted manually, but can be released using a button or lever. Similar to the side-folding blade, these switchblades release the mechanical energy of the spring, causing the blade to be released more vigorously. The blade is also more locked in by this spring. Properly functioning switchblades do not retract when the force of the user's hand meets the force of the object being cut. This is because of a lock. Linear locks use part of the knife blade to keep the blade open. Pushing the blade against the back of the frame of the knife relieves the friction caused by the design of the knife, allowing the blade to be closed. Picklock switchblades pry a lockbar, which releases a small pin, which pushes the blade up. Another variation is the bar lock. With this lock, pressing a button causes a spring to engages a notch. This notch gets pushed into a groove on the knife, which then holds the blade into place. How Does a Switchblade Work?